Jacqueline Bishop's research program focuses on understanding the multiple processes that influence adaptive and neutral genetic variation in natural populations, together with the human ones that interrupt the system. She started her career as a behavioural ecologist but rapidly realised that with the skills of the molecular lab in tow she could explore and understand the natural world to such a greater degree than by mere observation alone. She works at both broad and fine geographic scales and satisfies her love and respect for the natural world by studying as a broad a range of species as possible. This approach allows for a clear comparative framework and Jacqueline uses both evolutionary and ecological perspectives in trying to understand human impacts on species. 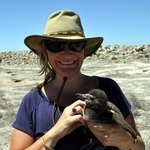 She has a particular interest in how we can use genetic data to better understand past and present population connectivity and has a number of current projects underway exploring wildlife health in human-impacted land and sea-scapes. Here in Cape Town, Jacqueline and Justin O'Riain have been working on the impacts of urbanisation on dispersal and gene flow, starting with the baboon troops of the Peninsula and those they were very recently connected to in the Boland and Overberg areas just 50km away. As part of their research they have also analysed the spatial distribution of variation at genes of the immune system. This data will better inform local management of a sustainable and healthy baboon population that is, today, ecologically trapped on the Peninsula. Their broader research collaboration sees an expansion of their combined approaches to include the elusive and largest remaining predator on the Peninsula, the caracal. Her role in the Urban Caracal Project is supporting the genetic and disease components of the project.